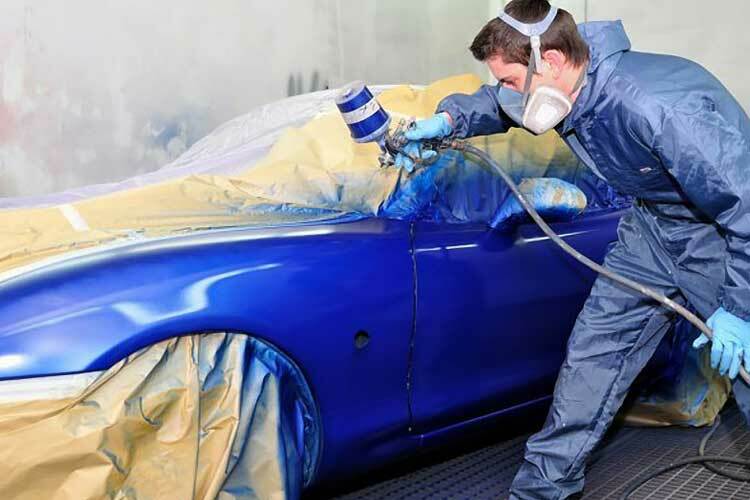 If you are planning on revamping your car colour and want to save thousands of dollars, DIY car painting is a perfect option for you. If you are looking for How to Spray Paint a Car, here is the easy DIY method. This DIY method will help you to easily spray paint your car. the car painting is actually a time-consuming task but not difficult. It is best to set aside at least a couple of days to neatly spray paint the car. It is best to vacate the shed so that external elements don’t damage the final setup. Stock generously grit wet and dry sandpaper, masking tape, old newspapers, air compressors, primer, powered sander, face masks, safety goggles, enamel paint, topcoat, dust extractor and definitely a spray gun. If you own a small size or medium sized car, 1 gallon of primer is good to go. Along with-it stock gallons of topcoat and clear coat. For big cars double the quantity for best results. Professionalscan work effective in less than these quantities, but with practice, even an individual can achieve the desirable results. It is better to have a higher quality if you are a beginner. Make sure the work area is neat, clean and without any dust particle. Wash the car well and clean the entire surface for dust and minute particles. Decide what you want to paint? If you want to paint the engine bay, truck and inner doorsills take necessary measures to strip the car. If you are looking to paint only the exteriors the task is simple and you won’t take much time. Get started by putting your face mask and safety glasses. Don’t forgets to switch on the dust extractor. Begin the stripping in a circular motion, in order to achieve the best and perfect finish, neatly sand the car. The entire activity can be time-consuming but this step is just to get a smooth finish. Start with the car back to metal and wipe the entire surface with a clean cloth, make sure there is no dust particular. Allow the thinner to evaporate compete before starting. Cover the area which you don’t want to spray paint with the help of old newspaper and tapes. Make sure this is done perfectly so that you don’t overspray. Before getting started, mix the primer well with thinner, for ratio check the paint can instructions. The ratio is usually different for different car painting brands. Before getting started, practice the spraying technique on cheap car panel or any scrap steel. Always hold the spray gun at least 6 inches away from the panel and spay gentle. Tap on the trigger button only when you move the spray gun. Avoid holding on the spray continuously in a particular spot as it will lead to a thick layer on the spot. Once you get a hang on it being to apply the primer on the car, start from the roof to down. Apply a thin coating of primer and 2-3 coating is enough to convert the surface. Apply the spray paint on the car to dry complete, follow the instructed drying time. Every coat will take last 10-12 minute of your time. The time frame is 20-25 minutes if you want to do recoating. Mix the paint and thinner as per the ration mentioned in the paint can. Apply the top coating following the spraying technique. It will take 10 minutes to apply on every coating and the time is 20-25 minutes for entire recoating. Make sure to apply at least 3-4 coating of paint, moreover never compromised on the recommended drying time between every coating. Before spraying the final coating remove the powder residual if any with the help of sandpaper and wipe it very well. Once everything is done, make sure no tape or newspaper is stuck on wet paint. With the help of buffer, buff paint in circular motion. Avoid buff paint in one spot for a long-timeframe, it can lead to burning of paint. With some practice and persistence, you can easily DIY spray paint your car without shelling out thousands of dollars from your pocket.